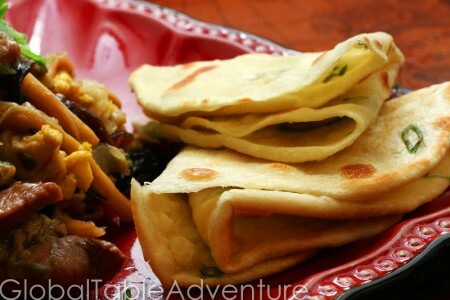 Chinese Pancakes are quick and easy to make… and wonderful for scooping up stir-fry. The key to obtaining the characteristic chewy texture is to use boiling water. Make sure you use a healthy dose of salt to flavor the dough. Serve with Moo Shu Pork. 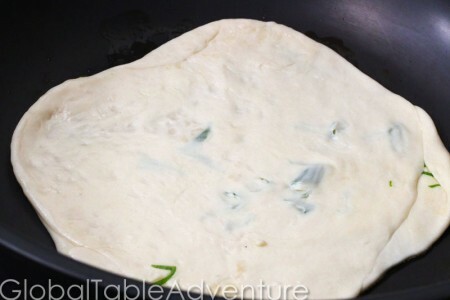 Add boiling water … boiling water actually blanches the flour (cooks it briefly) and makes for a nice, chewy pancake. 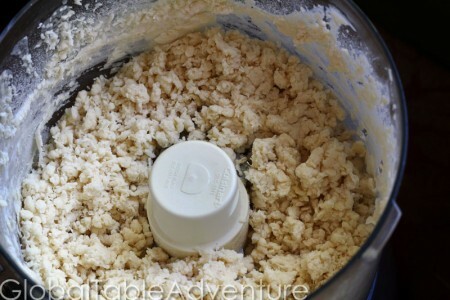 This is desirable because the texture will hold up better to moist stir-fry mixtures. Pulse until dough starts to come together. I used my hands to press the shaggy bits into a smooth ball. The dough is not sticky and should not cling to your hands much. 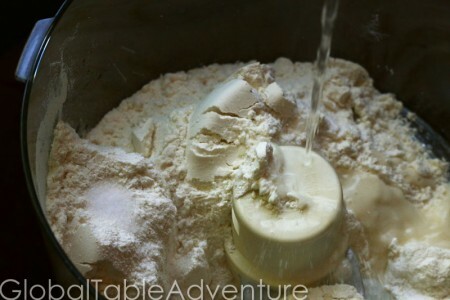 Add more water or flour as needed to get the right texture. Let rest for about an hour. The dough will relax and become super easy to work with. Press them flat with the palm of your hand. Drizzle fairly liberally with sesame oil (or whatever oil you happen to have – but sesame oil tastes grand!). 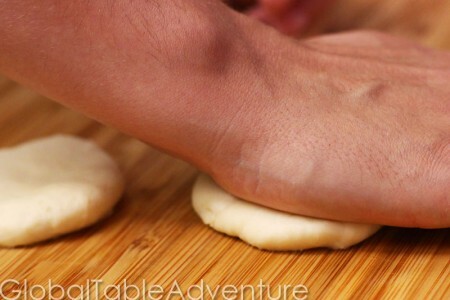 Spread it evenly around by rubbing the two discs together. 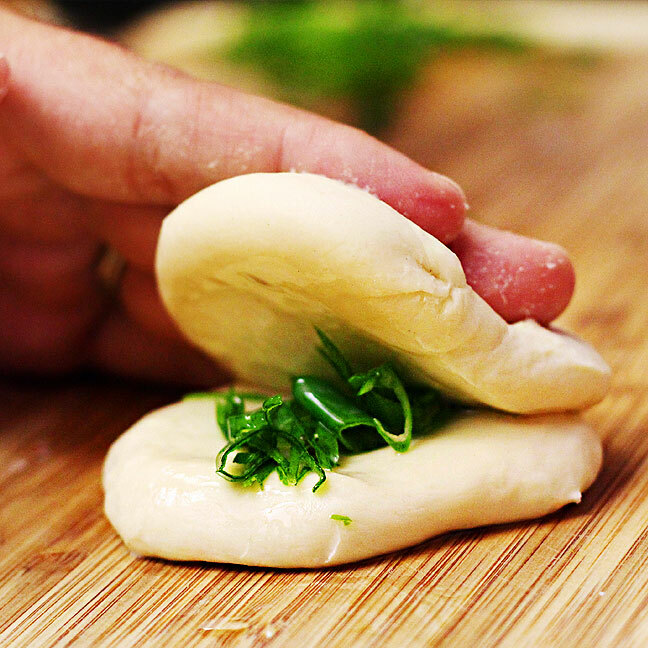 Sprinkle with a bit of green onion and press the two discs together. Roll thin. At first it will be slippery and the discs will want to separate. 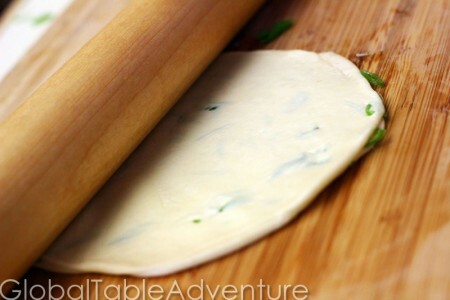 Once it gets a bit thinner, the dough will start to stick and hold together better. Place in a medium-hot pan with a bit of oil. Cover and let cook a couple of minutes, or until light golden brown. When they come out of the pan you’ll be able to separate the two pancakes from each other! Wicked cool. Fold in quarters and serve alongside your favorite stir-fry, like Mu Shoo Pork. Mmm. 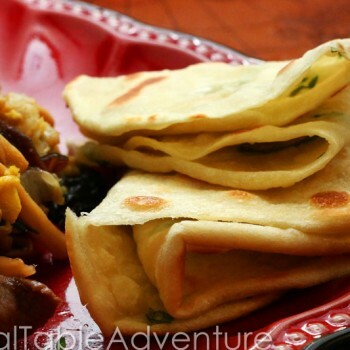 Recipe inspired by Mark Bittman’s “Scallion Pancakes” in The Best Recipes in the World. 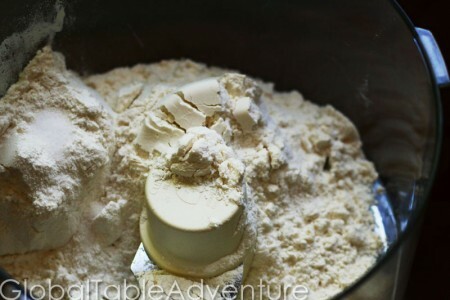 Add flour and salt to a food processor and add boiling water. Pulse until dough starts to come together.I used my hands to press the shaggy bits into a smooth ball. The dough is not sticky and should not cling to your hands much. 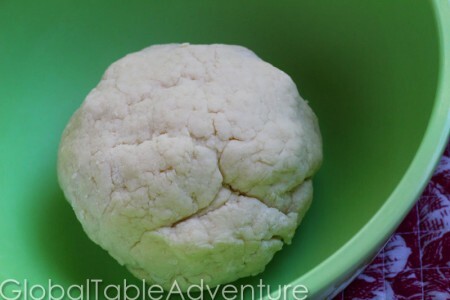 Add more water or flour as needed to get the right texture. 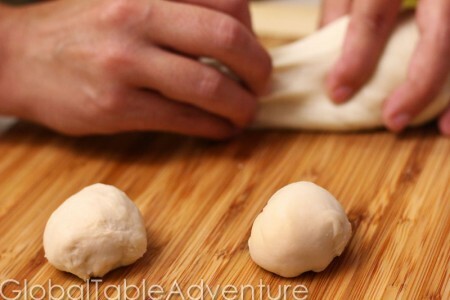 Make small balls of dough (you need two at a time). Press them flat with the palm of your hand. Drizzle fairly liberally with sesame oil (or whatever oil you happen to have – but sesame oil tastes grand!). Spread it evenly around by rubbing the two discs together. 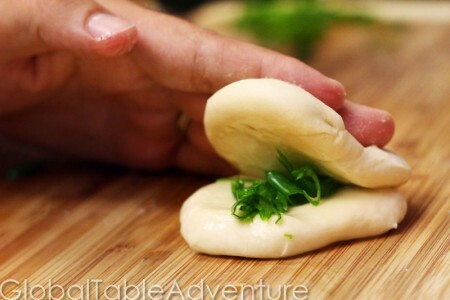 Sprinkle with a bit of green onion and press the two discs together.Roll thin. At first it will be slippery and the discs will want to separate. Once it gets a bit thinner, the dough will start to stick and hold together better. Place in a medium-hot pan with a bit of oil. Cover and let cook a couple of minutes, or until light golden brown. 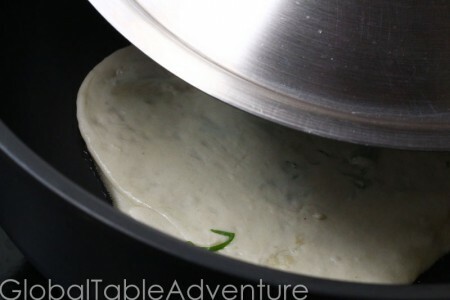 Flip and cover again.When they come out of the pan you’ll be able to separate the two pancakes from each other! 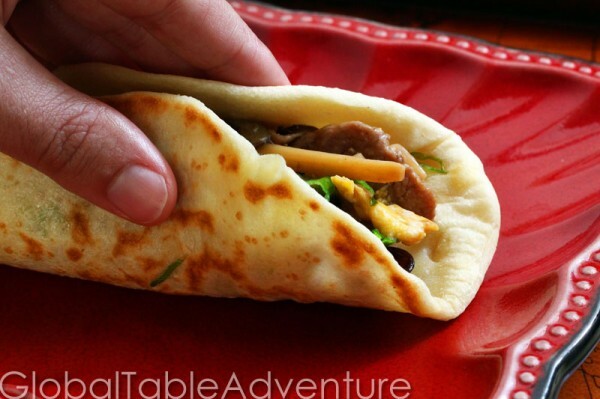 Wicked cool.Fold in quarters and serve alongside your favorite stir-fry, like Mu Shoo Pork. 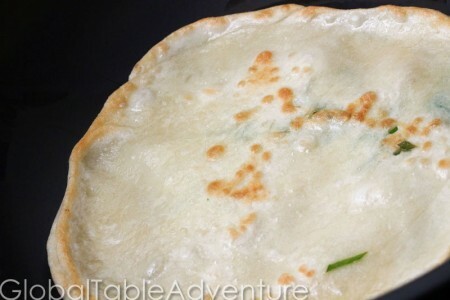 Pancakes are a favorite breakfast food in parts of northern China, and Chinese immigrants to the US from those northern cities will travel for miles to satisfy their breakfast cravings. Here is a report by a young Chinese woman who stumbles upon a gathering of old men from Tientsin eating pancakes in a market stall in Queens, NYC. 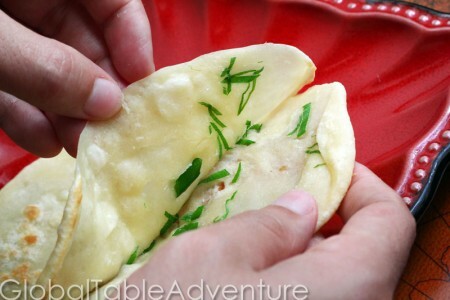 that’s looks yum and fun to make – i will try it soon! These look wonderful! I can’t wait to try them out! I have to say too that Ava is just adorable. I love watching the Ava videos. My little almost 3 year old watches them with me. He’s a very picky eater, so I like showing him how she takes bites and tries things! My mom makes this all the time, but she does it in the traditional way. 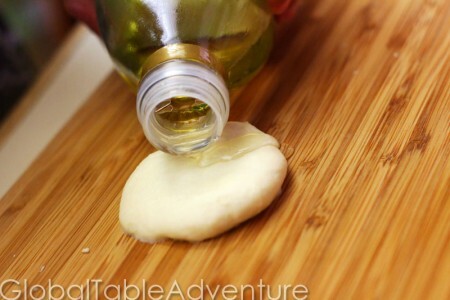 To make these would be to roll out the dough, rub the vegetable oil over the dough, sprinkle on the salt, spread on the filling, roll it up, cut it into thick slices, and roll out the slices. It does this really nice spiral design. what type of flour is used?